IBM Lotus Domino Web Access 6.5 (IBM Lotus iNotes Web Access) is a sophisticated Web client that gives end users many of the messaging and collaboration features previously available only with a Lotus Notes client. Beginning with Domino 6.5, you can access Lotus Domino on a Linux server while using Domino Web Access on a Linux desktop, giving you a leading-edge, end-to-end collaborative solution for Linux. Browser users will be able to take full advantage of Domino services through an ultra-intuitive, easy-to-use interface, both online and offline, seamlessly. Domino Web Access was architected using the latest Web application development technologies and can be administered centrally, helping organizations to drive down deployment costs and, potentially, reduce Total Cost of Ownership. 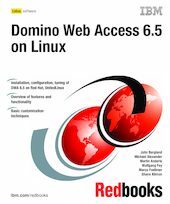 This IBM Redbooks publication provides a detailed technical overview of Domino Web Access 6.5 and discusses how to install, configure, and deploy an end-to-end Linux solution for Domino. In addition to setting up DWA 6.5, it also covers how to integrate Lotus Sametime for real-time collaboration and awareness. Finally, we discuss key deployment considerations, integration points between Domino Web Access and IBM WebSphere Portal, and some approaches and techniques to customizing Domino Web Access 6.5.